If you’re still a big fan of zombies and zombie-type game modes, you might want to consider downloading a straight up zombie mode game on your phone. The Google Play Store is full of these games, though that makes it hard to choose a favorite. Read our article below and we’ll show you one of the newest and coolest zombie games for Android. It’s called Bermuda: Dead Gold. What is Bermuda: Dead Gold all about? For all Android users that want to experience the thrill of shooting zombies and discovering hidden treasures, here comes Bermuda: Dead Gold, one of our favorite zombie shooters ever. 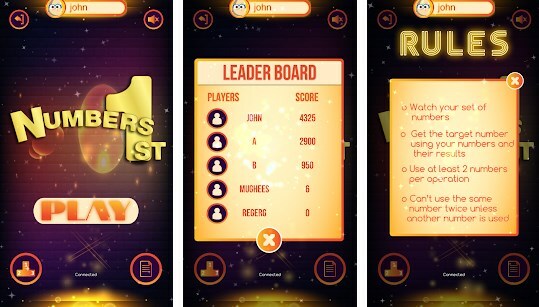 Both addictive and fun, this game app is simple to play, yet hard to master. This means you will enjoy neat controls and interface, follow simple rules, but you will face challenges that will test your gaming skills. Let’s discus the gameplay some more! In Bermuda: Dead Gold you play as a character that was sent to a lonely island that was taken by zombies. But the island hides a completely forgotten gold that you can discover. How? First fight and destroy the zombies by using your best shooting skills. Manage your character with the on-screen controls, shoot when needed and throw deadly grenades when attacked by zombie hordes. Survive as long as you can, don’t let the zombies kill you or else you’ll lose the game. Play and collect the gold in order to unlock all 6 characters. Each one of the heroes is designed with awesome gear, they have different fighting skills and use various powerful weapons. Also, try to beat their boss if you want to be the ultimate winner of this game. Pick your hero and face the incoming hordes of zombies, win the highest scores and challenge your friends to double the fun. Do you have what it takes to kill the zombies and to enrich yourself with gold? 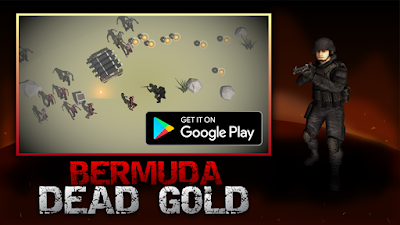 See for yourself by downloading the Bermuda: Dead Gold game – it’s absolutely free of charge on the Google Play Store. Staying up to date with the cryptocurrencies and their rates constantly can be quite hard because there are changes made very often. For you to protect your investments in specific cryptocurrencies is a smart choice to use an app that will alert you for any change made in a cryptocurrency you are following. Among so many apps, choosing the best on is not easy, so we did our research and we have for you one incredible app to help you keep track of cryptocurrencies. Let’s discuss about it. Developed for android users, easy to use, simple and yet very practical for each user interested in cryptocurrencies, the app allows each user to stay up to date with the cryptocurrencies he is interested in and keep track with the latest cryptocurrency rates instantly on his phone. This cryptocurrency app will offer users alerts whenever a change is made, informing him and allowing him to learn everything he wants to know about specific cryptocurrencies. With various features offered the user will be alerted constantly, whenever is necessary. What are the best features of Crypto Alert? The Crypto Alert will offer its users different practical features that will help them to stay up to date with the cryptocurrency world and instantly track cryptocurrencies they are interested in instantly, all directly from their phones. Users will get instant alerts whenever there is a change in the cryptocurrencies they follow, getting the latest rates of cryptocurrencies they are interested in. 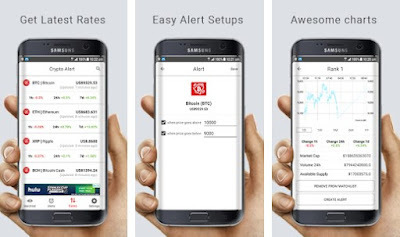 The app offers easily alert setups allowing the user to easily set the alerts for the any cryptocurrency he wants to. More than that, the app offers amazing charts that are quite easily for the user to digest, allowing him to get the full information for each cryptocurrency he needs to learn more, effortlessly. Directly on the dashboard of the user’s phone the app offers users to get simple alerts when a change is made, easily keeping track of any cryptocurrency. Instantly, all inside one simple app, the user will be alerted every time and get all details he needs to know about specific cryptocurrencies he tracks. Download the app now on Google Play for free to stay up date with the cryptocurrencies you follow! In theory, there are advantages to a to-do list app. The potential is there to do way more than what pen and paper can do. 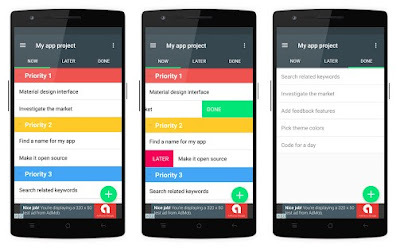 A to-do list app should feel like a superpower in your pocket. You should get more things done, more easily than you would without it. Otherwise, what’s the point? In this post, we’ve researched some of the top to-do list apps and listed out a few pros, cons and notable features below. Check out below for how some of the top to-do list apps can help you! We proudly want to present our selection of a productivity app proposal that is programmed and designed to help you in creating tasks, save data and update you on your progress. The name of this incredible productivity app is Tasker: To Do List, easy-to-use To-do list app which primary purpose is to assist you in creating task lists, categorize all your tasks, prioritize, modify and update them, or at least you can use it as a reminder tool. Tasker offers the possibility for unlimited to-do list and multiple color choice, to create multiple task lists with headings and sub-list. There is also the tool to sort the tasks by priority, name, and date. The apps function pretty much simple: add a reminder, store notes and modify your task at will. Enjoy your work, duties, responsibilities and get all the thing efficiently and on time. There’s no better application that will improve your productivity and make your life organized as ever before. Visit the Play Store Link at the end of this article and download Tasker: To Do List on your Android device for free. Feel and enjoy the differences in your day to day life. Toronto, ON – The Lotus by SEAM, a new personal safety wearable device, is now available for purchase at SEAM’s website (www.seamtechnic.com). For $129.95, customers receive both the Lotus and a 1.7-ounce mobile charging case that can keep the Lotus powered for up to 42 hours. A portion of all Lotus sales will benefit the Canadian Women’s Foundation, a national non-profit organization that empowers women and girls to move out of poverty, out of violence, and into confidence and leadership. 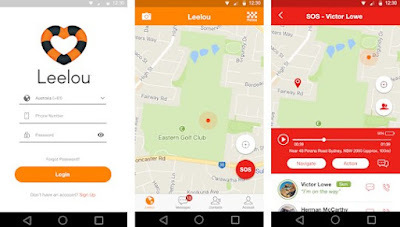 Consisting of the Lotus, app and cloud-based storage and streaming service, the SEAM personal safety platform keeps people connected, social and safe by sharing contextual data, including GPS location, images and full streaming audio with a user’s chosen personal network real-time. Keeping people safer than a GPS tracker or panic button, the connected Lotus device pairs with the free iOS/Android app for smarter personal safety. The Lotus is the only personal safety device on the market that enables two-way, hands-free audio calls directly from the device, as well as featuring Voice Assistant access. Users can perform standard Siri or Google Assistant voice-controlled features such as sending text messages, setting reminders, or control their SEAM app. The Lotus works as a remote control for the SEAM app. With the app, users can record and share experiences with images, full streaming audio and precise GPS location with up to 5 contacts. Data can be saved and kept private for personal use, or shared with a chosen contact. In the case of an emergency, the Lotus lets users make a hands-free phone call to a guardian or emergency services. Pre-orders for the Lotus comes with a free accessory for a limited time at www.seamtechnic.com, and every purchase includes a 3-month subscription to SEAMplus where data can be saved for up to 3 months. The small but powerful Lotus can be worn as a necklace, bracelet or attachment and accessories will be available in the coming month. The battery life for the Lotus is over 7 hours standby and 5 hours of talk time. The accompanying charging case allows the device to be charged up to 6 times on the go, for a total of 42 hours of use. Founded in 2016 by award-winning designers, SEAM is smarter personal safety designed to keep people connected, social and safe through recording and sharing rich contextual environmental data, including location, photos and audio. SEAM consists of an app, connected wearable devices and a secure cloud-based sharing network. SEAM’s mission is to make peace of mind seamless and empower people to focus on living their lives. The company is based in Toronto, ON. If you have been having trouble waking up to get the day started and you can’t find the perfect alarm to help you with this, luckily for you there is no shortage of alarm apps for you to try out. When it comes to choosing the best alarm clock app for your smartphone, among so many apps it can be quite hard finding the most efficient one. However, to make your search easier, we did our research and we found one amazing alarm app with additional features. Let’s discuss it. Developed for Android users, easy to use, very simple and yet practical and efficient, this is an alarm clock which is offering additional features such as a timer and stopwatch. All the features offered on this alarm app can be easily customized by the user by allowing him to choose among numerous themes offered by the app. 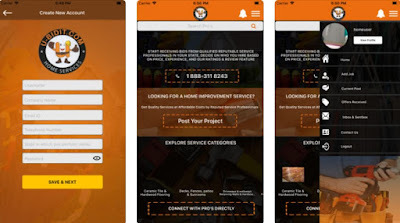 With this amazing app, the users have the chance to use 3 different features available in one app, all directly on the user’s phone whenever he needs it depending on his needs. What are the best features of Light Clock? The Light Clock with the various features offered on it is allowing each user to find all he needs inside one app, using an alarm clock, timer and stopwatch all in one place. Depending on the preferences of the user, the features offered can be customized with many different themes available on the app. Users with this app have the chance to choose between their favorite, tunes, music and sounds, setting their alarms and choosing options for setting multiple alarms with snoozing options. By setting the alarms on the app, the user also has the chance to set a time for it, a maximum number of snoozes he wants, all that without any effort, easily and quickly. 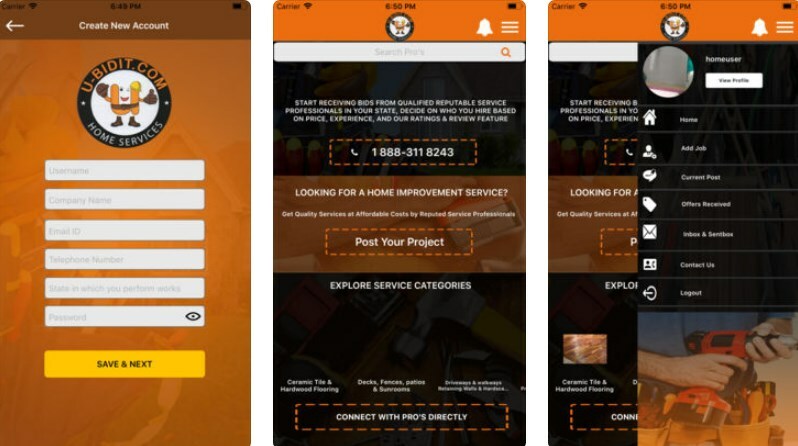 Users can use the app’s timer and set for it an exact time, countdown and repeat with loop timer options, setting the timer for any situation they need it perfectly. The stopwatch on the app is offered with up to 99 hours duration. Each user with the app gets all 3 different features inside one efficient app with the chance to customize it as they want to. 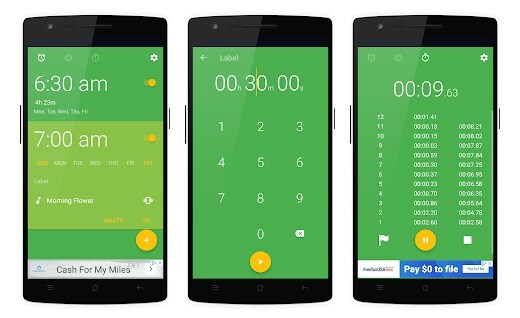 Download the app for free now on Google Play and get alarm, stopwatch, and timer in one place! What’s better than a free game? Pretty much nothing. Except when it’s terrible and you’ve wasted time on downloading and playing it. Fortunately, there are loads of fantastic free games for Android – and we list the very best here on our site. Whether you’re into word games, endless runners, platformers or puzzles, there’s something on the Android platform for you. Follow though the whole review to see what we’ve picked for you today. What is Racer Fight Simulator? Today we’re sharing with you one of the most entertaining games we’ve played this week - Racer Fight Simulator. Racer Fight Simulator is an awesome racing game that’s been brought to the Android platform by the developers over at Renagames, and soon to be released on the App Store too. We liked this racing/fighting game because it is created with an original concept, a fun unique gameplay, and tons of other features. Let’s discuss them some more! Racer Fight Simulator shines with intuitive user interface, neat on-screen controls and great visual effects. In this game you play as a young enthusiastic racer. The main objective is to defeat other racers, win more races and become a real champion. Take part in challenging quests and use your best skills to earn money in the game and purchase the items you need. Get food for energy, stones, potions, weapons, materials, artifacts, lucky coins, medic kits, and other items to fight. Earn money from the races you win in order to upgrade the items you have, to upgrade your personal skills and your whole equipment. You can even hunt items and rare materials! Collect energy supplies randomly dropped on the track to enhance your efficiency while racing, fight the police and don’t get knocked down because you will end up in jail and pay money to be released and free again. In the new version of Racer Fight Simulator, players will be able to become a real manager, so racers will race instead of you and your job will be to monitor and upgrade for them. Additionally, you will receive cool daily rewards, get a tutorial, customize the game’s settings, and use a ranking system. So if you want to check out the game for yourself, download it right away – it’s free on the Google Play Store! If you play puzzle games then you know how challenging it can be sometimes to solve the puzzle especially if your time is limited. But if you want to take the puzzle experience to the next step then you should certainly try a combination of math and puzzle game. This kind of game will certainly test your skills while offering you hours of fun. We did our research and we have for you one incredible math puzzle game that offers you all that. Let’s discuss about it. What is so special about this math puzzle game? Developed for IOS and android users as one incredibly challenging and fun multiplayer math puzzle game which has to offer all puzzle and math lovers the chance to test their math skills and push their brain to think harder in order to get the target number required before the time runs out. Players will get their chance to compete against other players from the whole world while trying to win their high scores and get the target number, getting their chance to get on top of the leaderboard and become masters of this math puzzle game. What are the best features of Numbers 1st Multiplayer Math? The Numbers 1st Multiplayer Math is offering users hours of fun and challenges playing it and enjoying all the features offered on it. With playing the game, each player is offered to compete against 4 other players, trying to get the required target number and all that just by using the numbers he dealt with and the results from the various operations used. Just by having 35 seconds for solving the puzzle, the players need to do it before the time runs out and some other player reaches the target number. Faster players will get higher scores and using lesser numbers for doing that will be better for the player too. With getting enough scores for the other rounds and winning against the other players the player competes against will bring the player the title of the ultimate player, getting him on top of the leaderboard. Easy, medium and hard mode are offered and when playing the player must watch his sets of numbers and get the target number without using the same number twice unless another number is used in between of it. Changes will be made to the game as well, changing the 4 players and adding a 2 player mode. Download the game on Google Play and App Store to solve the math puzzles and compete with others! A couple of days ago, one of our team members reviewed an app called EmMa, but since we find it so useful and unique, we decided to share it with you, our readers, again. But this time it’s our Health App of the Month. If your everyday anxiety and stress affects your lifestyle, health and relationships and you don’t know how to deal with it or find the relief you need, keep on reading and see how EmMa can help you. 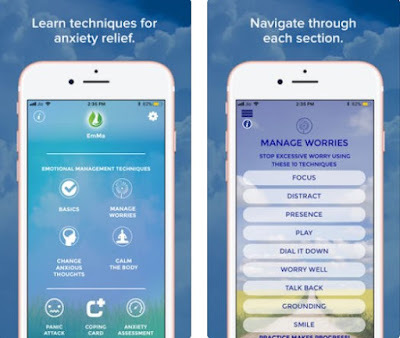 Manage anxiety, feel better and improve your life with our today’s app recommendation. We’re talking about EmMa, an incredible iOS app that provides with simple, practical and researched-based techniques that will help you get relief from anxiety and break the worry cycle. Created by Dr. Patti Johnson, this mental health tool shines with intuitive user interface and tons of helpful features. Why we love this app? First of all, we think it’s a great way to deal with your anxiety; it’s a helpful tool that can break your worry cycle, stop your panic and get you the relief you need. Offering 35 techniques for anxiety relief and simple step-by-step instructions for each technique, EmMa is here to give you a hand in managing the daily stress. These techniques are organized in 4 groups: BASICS (easily learn how to understand, recognize and evaluate your anxious thinking), MANAGE WORRIES (break the mental habit of unproductive worrying), CHANGE ANXIOUS THOUGHTS (manage the thoughts that lead to anxious thinking), and CALM THE BODY (meditation techniques that you can practice daily to calm your mind and soothe your body). 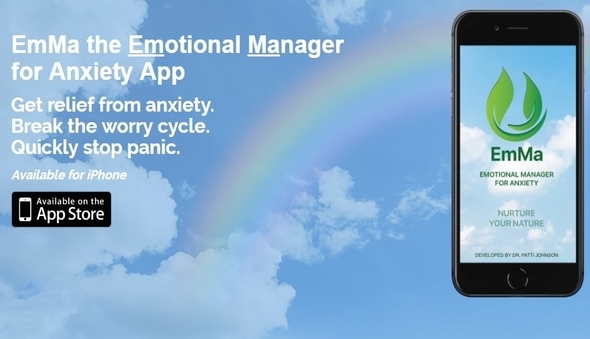 The app includes other features as well, such as panic attack audio guide with 6 steps to stop it in its tracks, coping cards, mood tracker to follow your mood and progress, social support to send alerts to a person you select, and many more. You can download EmMa from the App Store link below, available with one-time fee and no in-app purchases. Don’t forget to check out its official website for more information! Our pick for the Most Useful App of the Week is a reliable, efficient and innovative SOS alert personal security app, currently available on both Android and iOS platforms. With powerful safety features and friendly user interface, this cross-platform app adds a sense of calmness and keeps your neighborhood safe. Let’s see what the app’s all about! Even with a good news app, most are unlikely to have time to read all of those news stories at once. What if there was an app that offers you to read more news in less time, loading up news as soon as you open it? Well, there is. For anyone interested in keeping track with the science world and learning the latest science news and articles, we did our research and we discovered the fastest science news app that offers you all that. Let’s discuss it. 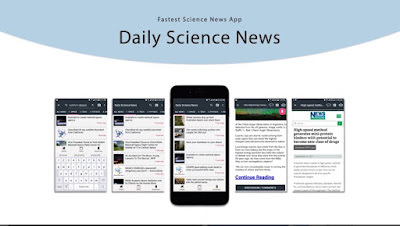 Developed for Android users this science news app has to offer all science readers the fastest way for them to read daily science news, articles and topics in less time, just by opening the app, loading all daily news available, all directly on their phones. By using the app, the users have the chance to browse find and read the latest science news and articles from many different categories, keeping track with the science world on a daily basis. Using the app will help users learn more about the latest science discoveries and stay up to date, never missing anything that happens in the world of science. What are the best features of Science News Daily? This app as the news app for science readers is offering various features that will make it easier for the reader to discover and read all the latest science news and articles on a daily basis, reading more in less time. Just by opening the app, the user has the chance to load up the news and all that available with fewer options and minimal design, offering the simplest way to read everything they want. Without limitation on scrolling, the user can scroll up and down to browse news from every category and he can swipe left and right to change and read news from different science categories. The user can turn news of or on from specific categories if he likes and he can access quickly all the features the app has in the Left Menu Drawer. Users can even share news using the share button in the top right corner and they can easily search to discover news depending on their interests using the search bar. To read the complete news, the user is offered the source news browser and each user can also bookmark news using the Bookmark manager, saving and managing links for future references. Exporting bookmarks to a CSV file to save them permanently is also offered and the user can choose in the settings menu between small and large list view and turn off notifications too. Science news and articles from the best science sources are offered and the user can discover many different science categories. Download the app for free now on Google Play to stay up to date and keep track with the science world! As a Music App of the Month we’ve picked an amazing online music player app that lets you find and listen to your favorite tracks. It’s called MeloDroid, currently available on the Android platform, free for download and presented with the friendly user interface. Listen to music and audio with this wonderful online music player app and enjoy! What is so special about the player? Developed for Android users, easy to use, practical, helpful and powerful, this music app is created especially for users that are looking for a simple way to discover music from the whole world and listen to trending music online for free. With this third-party client of SoundCloud, the users are getting a powerful online music player that allows them to discover music quickly and find any song or audio they like inside one app, without much effort. The app will help the users explore the online music world and experience the most amazing music from the whole world. What are the best features of MeloDroid? 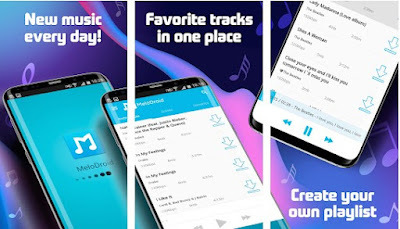 The MeloDroid has to offer all its users and music lovers amazing features that will get their music experience to the next level, all what they want and need inside one app. By using the app’s help, the user is able to search, find and listen to music and audios online for free, easily and quickly. Users can search through many genres such as pop, trance, rock, rap, disco, blues, classical, jazz and many more genres offered on the app as well. With this app, each user is able to explore the music world online and search by preset genres, discovering the trending music worldwide. Each favorite song of the user or his favorite music can be managed easily on the app and each user has also the chance to manage his local playlists as it suits him. Not only that the user gets to listen to free online music but also any song he wants can be played in the background easily. Users can even find lyrics of their favorite songs on the app and with all these features offered and this powerful music player widget, users will enjoy and explore the music world online anytime they want, instantly and directly on their phones. Download the app for free on Google Play to easily discover trending music and listen to songs online! There are plenty of great golf apps you can download onto your smartphone to enhance your game. We took the challenge to find one that’s worth a download and discovered one named Swing Profile. 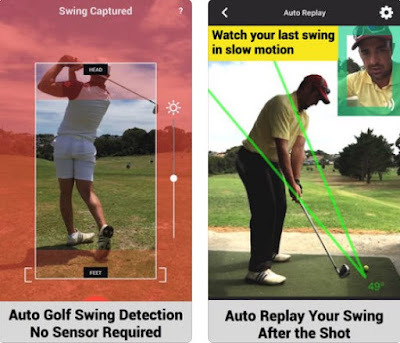 This is a stunning iOS golf swing analyzer app for both players and coaches. We liked it so much that we’re sharing it with you as a Sports App of the Week. There are loads of communication apps on both Google Play and the App Store, but today we’re sharing with you one of the most secure ones ever. Meet Vernam IM, a secure messenger app that fully integrates Vernam cipher which the only cipher with proven 100% crypto strength. Send texts, voice messages, and photos to people and enjoy absolute privacy! What is so special about this messenger? Developed for both IOS and Android users, this is one incredibly private and secure chat app which allows each user to chat with anyone he likes to, without worrying about his messages being kept or hacked by anyone else. Completely decentralized, the app offers unbreakable Vernam cipher which allows users to send instant messages, voice messages, and photos with high security and in complete privacy. Users with this private messenger can chat with friends, family, and others in complete privacy and total safety from anyone that they want to keep their conversations secret. What are the best features of Vernam IM? The Vernam IM and the features offered on it is helping each user to easily and without much effort make their private and safe space all just by using on a simple private chat app. 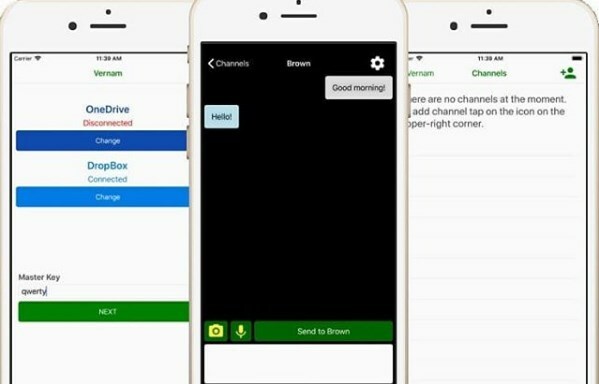 The app is allowing the users to use their existent OneDrive or DropBox account to transmit messages and with a folder, in the cloud service, they can communicate in complete privacy with complete safety. Users can even add a subscriber and he can make a scan or QR code that will provide the user with the highest protection he needs. With the protection of a quantum computer and with unbreakable Vernam cipher, this app does not need RSA and its’ fully decentralized, making sure no data is kept and all the conversations of the user stay secret. The personal data of the user is not required or collected by the app which allows the conversations of the user to stay a complete secret. No spams, no ads, and no registration even are needed on the app, and also without the sport of message history, the app makes sure that the user is not leaving any traces when using it. Download the app on Google Play and App Store for free to send messages and make sure they stay secret! 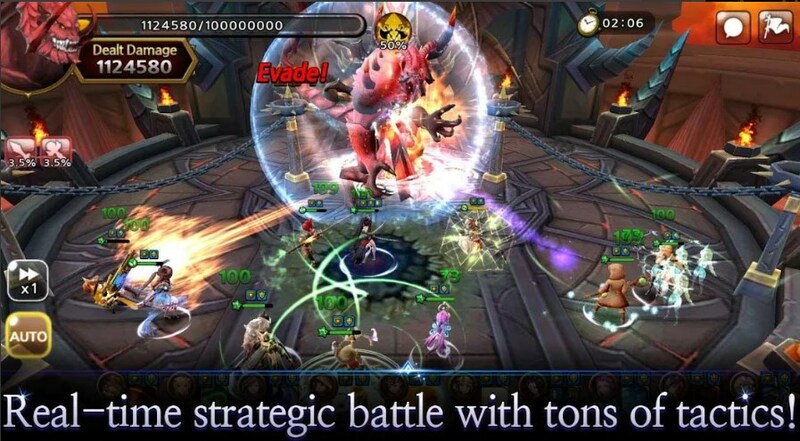 If you’re an Android or an iOS user that wants to play an endless RPG that combines strategy and action, we recommend you check out Guardian Soul, our Role Playing Game of the Week. 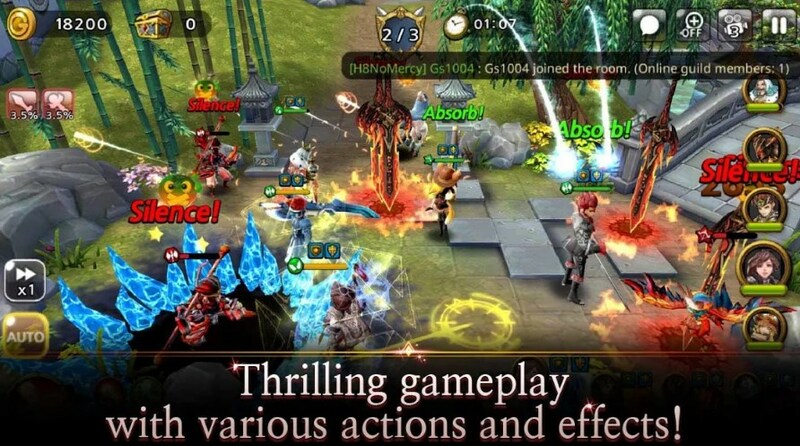 Prepare for real-time strategic battles with tons of tactics, exciting gameplay with amazing visual effects and actions, and countless challenging contests almost like MMORPG! What is so special about Guardian Soul? 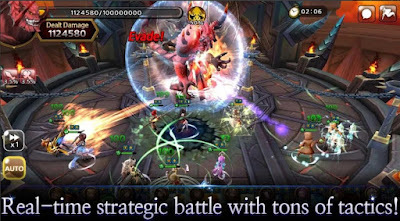 Developed for both android and IOS users, this strategy game is offering endless action, role playing and excitement each time the player unleashes the guardians to fight the demons in order to save the world from them. Combination of real time strategy and action, offering to play against player all around the world, the game is allowing the player to join the spectacular wars that commanders in the world are taking part in with lot of guardians and demons to fight. Unrestricted and intuitive RTS game controls are offered and the player will need to tap to drag, attack and move, healing easily like never before. What are the best features of the role playing game? The Guardian Soul for its players has to offer various features that will get them addicted to playing and keep their interest each time they battle the demons. By playing the game, players are offered variety of strategies they can use in real time and just by tapping they will be able to drag, attack, defend and move. On the game, players will be also able to choose among different guardians with numerous skills and if the player wants he can tactically create his own combination of guardians with the most powerful skills. The collection, nurture and growth system on the game is allowing the player to create his own special guardians and each guardian inside the game is updated regularly. Players have the chance to involve, upgrade, master and more, getting even special buffs which are depending on his guardian combination and collection. With total of 15 chapters of story modes this game offers diverse dungeons so the player can enjoy the real time network content with players worldwide. The game allows the maximum of 5 players to cooperate in real time and each player can go against other player in 3 rounds. The players are offered guild contents with users worldwide and they can choose to play bi-weekly guild battle, loot other guild's high grade resources and claim the world's best guild title. Download the game for free on Google Play and App Store to destroy the demons and save the world! If you are an Android or iOS user and you like idle games, tower defense, clicker games or roleplaying games, then our Strategy Game of the Month will definitely provide the fun you need. It’s called Tap Defenders, a free awesome game with a whole new concept of action defense. 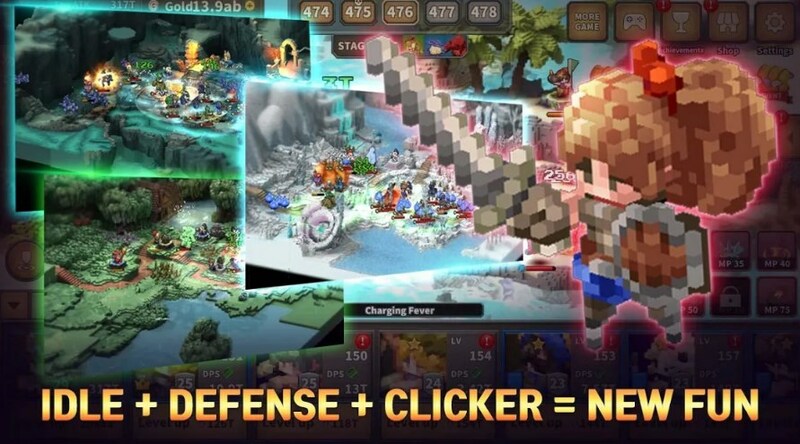 Developed for both Android and IOS users, this idle game is specially created to offer all players a new style of idle action defense. 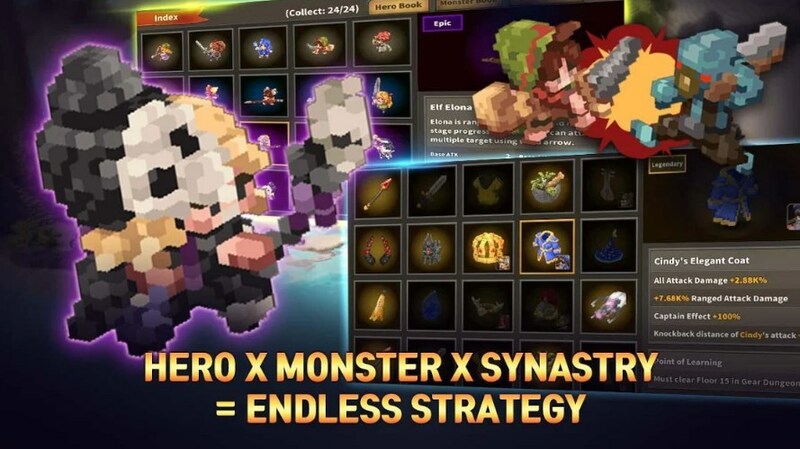 By playing the game, each player will have the chance to clear various dungeons offered to get full power while using his heroes to defeat all the monsters coming at him. Players will like the game because is a great combination of strategy, idle, role-playing and defense games. 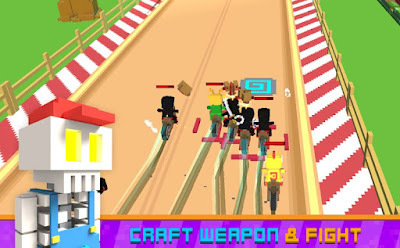 Incredible 3D voxel graphics are offered and each player will experience endless fun with endless upgrades while enjoying the automated idle online gameplay of the game. What are the best features of Tap Defenders? 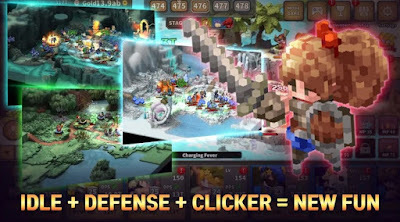 The Tap Defenders and the various features offered on it will keep players interested in playing while testing their strategy skills, letting them enjoy the incredible idle defense gameplay. Players need to defeat monsters with their heroes and clear dungeons to get full power. Each player has the chance to strengthen and upgrade heroes for defeating waves of monsters coming at him just with a tap on his phone. The players’ team of heroes can be customized by the player by preference so he can easily conquer the monsters on the way. With unique classes of heroes and different gears with special abilities offered, each player can collect them and even he is allowed to acquire spirit stones and strengthen his heroes by ascend system. The game has different modes with various stages to offer like the altar of awakening, mimic and gear dungeons too. The game allows players to compete against other players globally and be a part of daily rankings. Players can start their own clan of global users or join clans of other users. 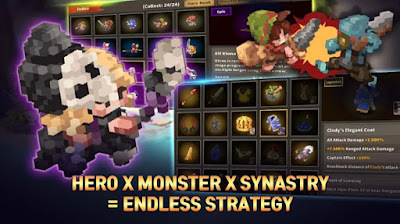 On the amazing action strategy, players will experience the most exciting idle gameplay with endless upgrades, fun, and collection offered for them. Download the game for free on Google Play and App Store to strategize and upgrade to get full power! We all know "there's an app for that." Usually we're referring to apps that make our lives a little bit easier somehow. But what if tell you that there’s an app that actually is rewarding? Meet LiveShopper, one of the best rewards apps on the market right now, a tool that lets you earn rewards, discounts, offers and great deals in exchange for feedback and completing small tasks while shopping or dining at your favorite place. Keep on reading to see how the app works and why we made it a Cross-Platform App of the Month. LiveShopper is a totally free cross-platform app that you can use to start earning rewards while shopping at your favorite destinations. Forget about filling out receipt surveys, clipping coupons, or saving up enough points for your rewards, now you can do it by simply giving feedback to places around you, like restaurants, bars, shops, hotels, entertainment venues, etc. 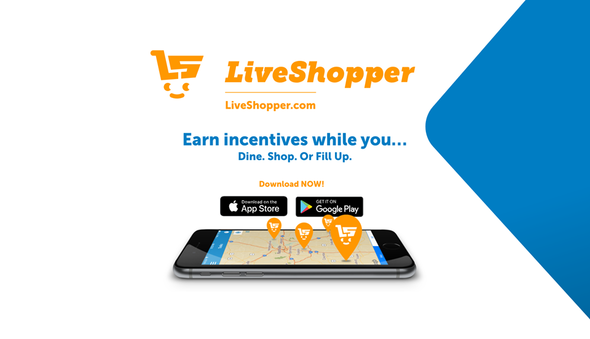 Earn rewards in exchange for feedback and perform simple tasks to redeem discounts and other offers with LiveShopper. When you are at your favorite locations, instant discounts and rewards help save you money. So signup with your email or use your Facebook or Google account to register and start browsing for LiveShopper tasks. View the task details before accepting it and then start it. Give feedback about the place and your personal experience while you’re there, answer questions and perform small tasks to later redeem your rewards that you may be able to use immediately or during your next visit. No more filling out receipt surveys, clipping coupons, or saving up enough points for your rewards, now the LiveShopper app allows you to complete tasks at your favorite locations which will let management know of your experiences and get rewarded for doing so. In addition, you will be able to view your rewards within the LiveShopper wallet, so you won’t lose track of anything you’ve earned. Easy to use, offering great deals and rewards, the app can be downloaded from Google Play or from the App Store. Get it today for free and enjoy! Slot Fruits Machine Freestyle – New Slots for Real Slot Machine Game Fans! Slot machines offer great amusement. But, often we are looking at the same old slot machines that kind of turn boring after a while. If you are in search for a new revamped casino slot machine game experience for Android, try Slot Fruits Machine Freestyle. Let’s see why it is a great new android slot machine game. We bring an amazing proposal of a casino game app that you shouldn’t miss it, especially if you’re enjoying gambling hobbies. Check out the Slot Fruits Machine Freestyle, a perfect realistic fruity slots machines game app that will produce a real and very exciting Las Vegas experience for you. That’s the main reason why you shouldn’t miss it! 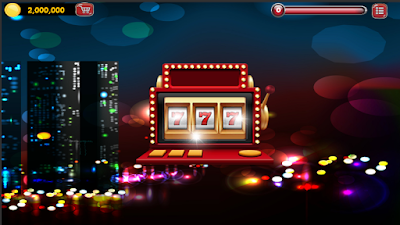 Enjoy the colorful fruity slot machines, unique design and authentic casino music and sound effects that will mesmerize you and hypnotize you in hours of addictive and exciting game play. Your mission as a player is to win coins, spin the wheel on manual or with the auto spin and feel like a real casino player with a big chance to win huge jackpots as you play and progress. Get Slot Fruits Machine Freestyle App on your Android device by free download on Google Play Store. Play it, enjoy it and share your thoughts and opinions with us! Whether you have an anxiety disorder, or simply feel worried sometimes, there are apps that can help with anxiety, and get you through your day. Depending on your level of anxiety, you might find it handy to monitor your feelings on your way to work, check in with yourself and de-stress midday, or find a way to fall asleep more easily. By downloading a few apps and keeping them handy on your phone, you can have quick access to help and support whenever you need it. Keep in mind though, that experts say these apps should never be the only way you manage your anxiety.